MTD Leaf Blower makes machines that carry a variety of brand names. In fact, MTD provides machines that are different colors (although the styling remains the same). All the machines have one thing in common - low price, good value, and durability made for the occasional use homeowner in mind. The MTD leaf blower comes in electric as well as gas powered models. The electrics are marketed under the Remington name, and vary from simple blowers to blower vacs that mulch dead leaves.. The fun begins with Remington Model RM180B Electric Blower, which is powered by a 7.5 amp electric motor. This is truly a basic, one speed blower, which would be identified as a ‘sweeper’ by some manufacturers. Air speed is rated at 150 MPH, with 180 CFM. The warranty is 2 years, and the price is an unbelievable $30.00. The MTD blower known as model Remington RM193BVT is upgraded to a 12 amp 2 speed motor that produces a maximum 215 MPH at 350 CFM. This machine is also a vacuum, and has a mulch ratio of 14 to 1. This means 14 bushels of dry leaves are reduced to 1 bushel of shredded leaves. The bag capacity is 1 bushel. The price is a very reasonable 50.00 for this low-end blower vac. Remington model Electric Blower Model RM1300 has the same 12 amp electric motor, with a reduced air speed of 150 MPH at 350 CFM. The mulch ratio is reduced to 10 to 1, with a bag that has a 1 bushel capacity. The intake tube resembles a vacuum for more efficient leaf uptake. The extra plastic increases the price to about $100.00. MTD Blowers also comes in gas powered versions. These are marketed under the Yard-Man brand. The first (and the one with the most interesting styling) is model Yard-Man YM320BV Gas Blower/Vacuum which sports a 31 cc 2 stroke engine ( need to mix oil with the gas). The air velocity increases to 145 MPH, with a 445 CFM flow rate, thanks to the stronger gasoline engine. The mulch ratio is 10 to 1, with a price of $150.00. Next up is model Yard-Man YM2BV Gas Blower with Vacuum Kit. The engine is a 27 cc 2 stroke EZ start, that has an air velocity of 150 MPH at 450 CFM. The mulch ratio remains at 10 to 1, with a 1 bushel bag capacity. The price remains at $150.00. Now for the backpack blowers. 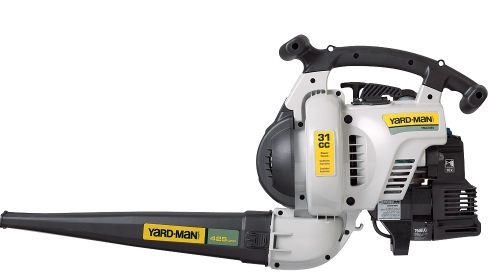 The MTD blower line includes 2 backpack models, again marketed under the Yard-Man name. Model Yard-Man YM2BP Backpack Gas Blower is powered by the 27 cc 2 stroke EZ start engine, that delievers 145 MPH air speed at 445 CFM. This is strictly a blower, and does not act as a vacuum. The price is $200.00. Want more power? Model Yard-Man Select YM45BP Backpack Gas Blower fills the bill with the 32 cc 4 stroke engine that gives air velocity of 150 MPH at 500 CFM. Count on spending more for this MTD king of the jungle. List price is $235.00.